Unlike the committee’s previous hearings, there will be few representatives from advocacy or religious groups giving evidence. 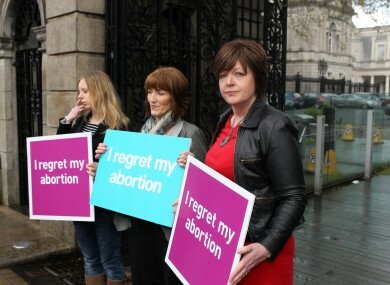 Members of group Women Hurt outside the Dáil today. THE OIREACHTAS HEALTH Committee has finalised its list of witnesses for three days of hearings on proposed abortion legislation. The public proceedings on the 17, 20 and 21 May will discuss the Heads of the Protection of Life During Pregnancy Bill 2013 with medical and legal experts, as well as members of the administration. Unlike the committee’s previous hearings, chaired by Jerry Buttimer, there will be few representatives from advocacy or religious groups giving evidence. Buttimer described the proceedings as “pre-legislative scrutiny” of the heads of bill. He noted that the committee will also examine written submissions from interested parties, as well as hearing from invited experts from the medical, psychiatry and legal fields. He said he regrets that all requests could not be accommodated. “As a committee, we hope that the debate is conducted in a temperate and moderate fashion, and that the hearings make a considered contribution to the shaping of this significant piece of legislation,” he added. Proceedings can be watched live on UPC Channel 207 and online at the Oireachtas website. They will also be streamed live on TheJournal.ie. Email “Here is the list of witnesses to appear at abortion hearings”. Feedback on “Here is the list of witnesses to appear at abortion hearings”.